Manufacturers today can’t ignore the online visitor if they hope to remain viable in the foreseeable future. Your website will be the gateway buyers will use to look at your business and you will have less than 8 seconds to persuade a visitor to take some action while they are checking you out. The primary goal for this first visit should be to just start the conversation. 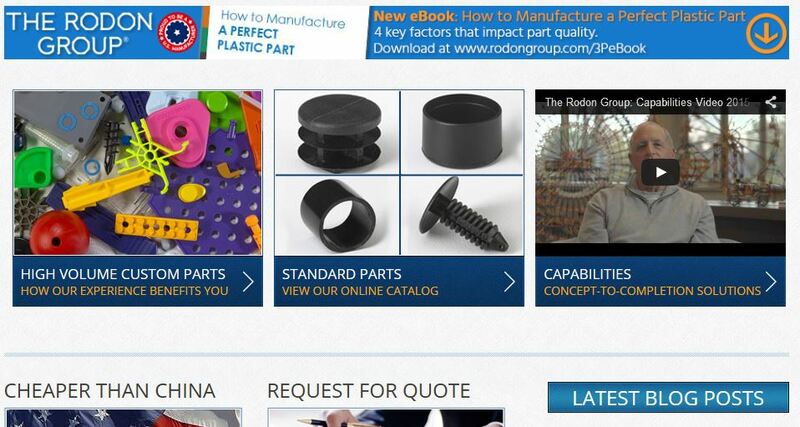 For most manufacturers, your online visitors are not looking to close the deal during their first visit, buyers are often just looking to create a short list of vendors of whom they may like to call, email or request more information via an online form. 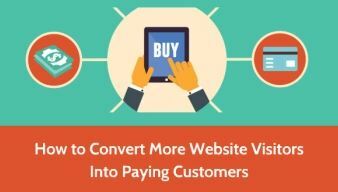 Know that these types of conversions are best case scenarios. 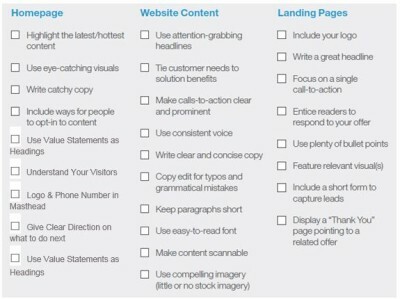 If the web page they look at is confusing, headlines are unclear or the layout does not make it easy to navigate, they will bounce to the next website on their list. That means your website or landing pages must capture a buyer’s attention and invite them to take a closer look. Regardless of what it cost to get a visitor to your website via SEO, Paid advertising or the best inbound marketing initiative…don’t leave your visitors unfulfilled with a poorly designed home page or landing page. For this example, The Rodon Group in Montgomery County uses 7 primary conversion paths a visitor to their home page can take. Cheaper Than China – I love this one! Read a Compelling Blog Post. As you can see, the copy gives the visitor directions on what to do next. Those are all Calls – To – Action and use verbs and arrows to guide the visitor. We can see that the first conversion path, “How To Manufacture The Perfect Plastic Part” offers the best opportunity to capture a lead. Therefore it is positioned above all these other paths. Knowing that part quality is a big issue for buyers, a free eBook on how to overcome this issue is the offer. The artwork promises the user possible solutions if they download this book and if they click on this banner, they are brought to a landing page that moves this visitor down the conversion path. So lets take a look at a well designed eBook Landing Page for B2B Companies. 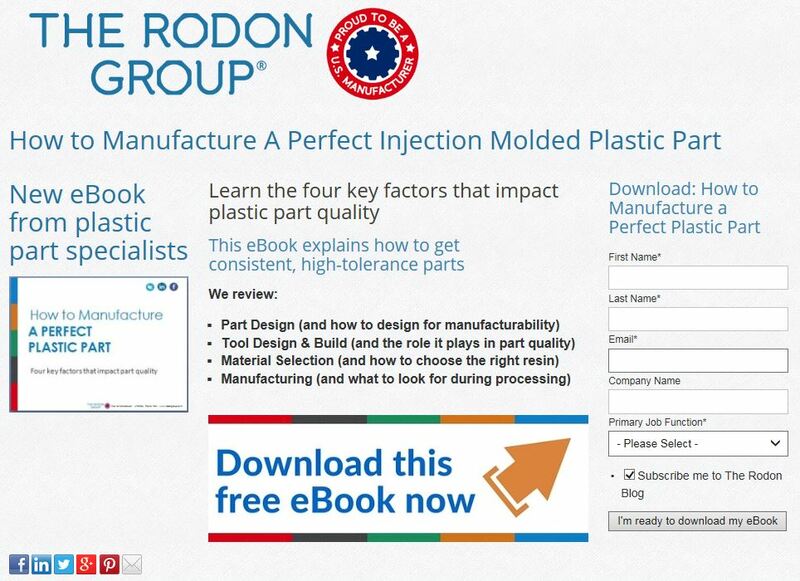 The Primary Headline reminds the visitor of what they are getting, “How to Manufacture A Perfect Injection Molded Plastic Part” and includes an image that supports the eBook Download. Next there are two benefit statements: “Learn the four key factors that impact quality” & “…explains how to get consistent, high tolerance parts”. These statements motivate the visitor to take the next action. The lead generation form is only 5 fields positioned to the right and the word “Download” is used in the form title, the button and in a graphic that points to the form. There is no question on what the visitor needs to do to get this Free eBook. A study by Marketo found that 5 fields on a webform converts better than 7 or more. Chances are that the lead goes into a email campaign to furthur qualify the visitor. My guess is that the prospect will get a phone call from a sales person 3-7 days later asking if they found the eBook helpful and offering them a middle funnel opportunity like a demo or webinar. Your B2B Marketing strategy should include not just improve lead generation but help move the prospect furthur down the sales funnel. 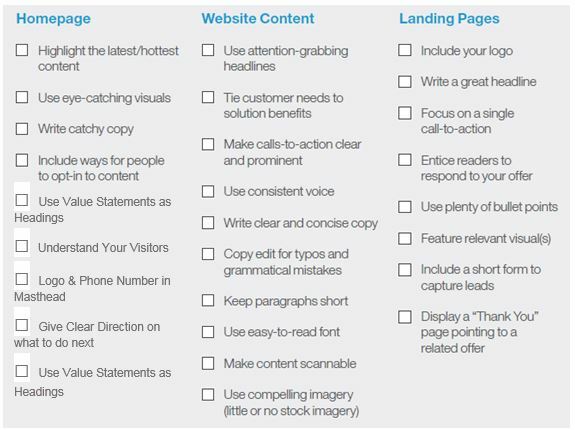 This Checklist will help you improve how your website converts but it cannot fix a poorly designed website. You clients and prospects will make a judgement call to make as soon as they arrive on your website. Weather to continue down a chosen conversion path based upon the first impression, or to move on. If your website looks amatureish, they may assume your operation is not professional either. Don’t skimp on getting your website done by a professional web development company. Interested in take the next steps in conversion rate optimization? Contact our B2B marketing consultant today or leave us a comment below with your thoughts on this topic.